WOOSTER, OHIO–One of the early spring pleasures of a geologist in the Upper Midwest is finally getting outside and scouting the field trips for the semester. Today we had bright sun and temperatures in the 50s (I know — I’m settling) so I went out to plan the late April field trip for my sedimentology and stratigraphy class. The sites I’ve been using in the last few years have become too overgrown, so it is time to find new projects in new places. Since the delightfully underbrush-free Mojave Desert is too far away, I’m looking at places in northeastern Ohio. It was a fun day. 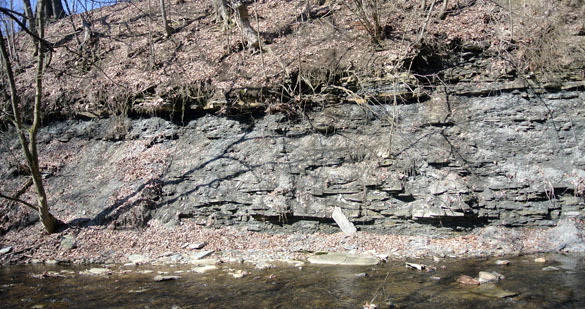 Above is an outcrop of the Meadville Shale Member of the Cuyahoga Formation (Lower Carboniferous, late Kinderhookian) exposed in the Lodi Community Park about 20 miles north of Wooster. A tributary of the Black River (the East Fork Black River) flows through a small valley, exposing the shale in its cutbanks. I’m a bit partial to this location because from here a fellow Wooster student found a trilobite that became the basis of my first scientific publication. The unit here is moderately fossiliferous and contains numerous rock types besides shale. It will make a fine place for students to measure and describe stratigraphic sections next month. It certainly was a beautiful place to spend a sunny Saturday morning. There were many turkey vultures (Cathartes aura) perched in the still-leafless trees in northern Wayne and southern Medina Counties. Here’s one keeping an eye on me. 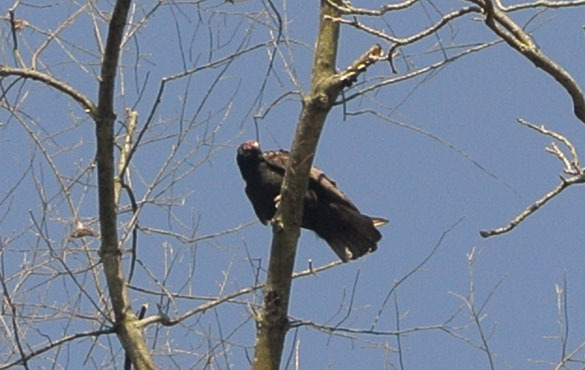 Turkey vultures are a sign in Ohio that spring really is coming (even if it is supposed to snow tomorrow morning! ).